Walk north. Leave Boundary Falls by the Gibraltar-Washpool World Heritage Walk. Enjoy the track while it lasts. On the way, detour to Duffer Falls and fill up with sweet granite-stripped water. Continue on but walk silently. Watch for flame robins. Keep an eye out for a subtle footpad, right on track, at the top of a rise, on a bend. Disappear into the scrub through hard bending banksia and heath. Head up. Weave footprints and foxtail rush. Create a path between granite boulders. Get scratched. Beware of eyepokers. Emerge from behind New England mallee and find the open space. You are now the needle on Haystack Mountain. 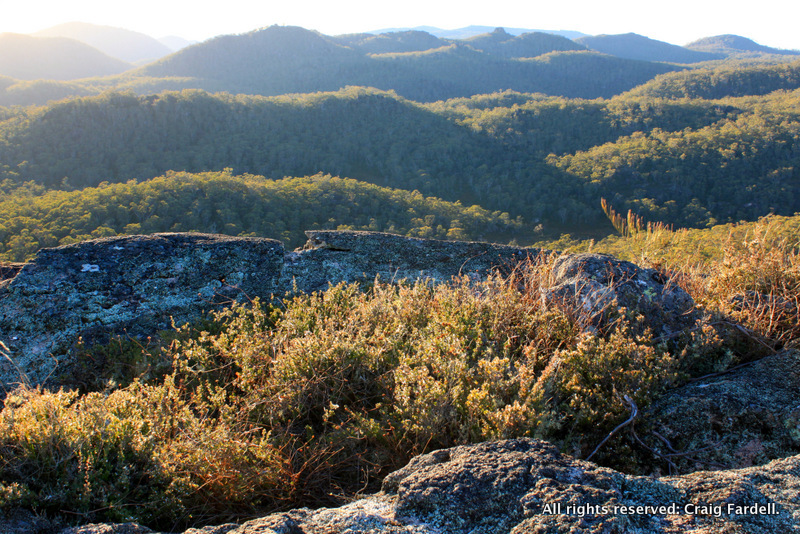 Haystack Mountain is one of many granite peaks scattered through the high country of Gibraltar Range National Park. This particular tor reaches 1155m elevation, although the climb to the top, from where you leave the main track, is only a height gain of 140m. The top of Haystack Mountain is scattered with large, weathered boulders. They are wind carved, water sculpted shapes, like a rhinoceros head and one with the face of a monkey. From the summit there are uninterrupted views, the full 360. The top of Haystack Mountain is flat and open: to the east Waratah Trig juts above the treeline, west is an extensive, heavily forested plateau and the upper reaches of the Timbara (Rocky) River, to the north and east Washpool National Park's deep green valleys dip away into shadow. This peak made our finals list for Campsite on the Year 2012 (see story here) as we spent a peaceful afternoon and evening watching the changing light and lengthening shadows. A cold wind was blowing. We had bivvy bags to keep out some of the breeze but the night and early morning were both bitterly cold. We sat above everything: ate warm porridge for breakfast while the sun brought the treetops to life. The World Heritage track snaked through forest below. We watched to see if other walkers might troop past. No-one came. After breakfast on Haystack Mountain we retraced footsteps. Weaving, weaving, weaving down to the trail: through grass trees with shivering spines, kissing bearded heath, clutching at Youman's stringybark. Back on track we walked from lyre bird to lyre bird. Found our way out of the Haystack and home. The Gibraltar-Washpool World Heritage Walk is open to mountain bikes as well as walkers. For a great trip option you could mountain bike the 65km loop, or sections of it. Ideal for a mountain bike/bushwalk adventure with the option of a light weight bivvy on top of Haystack Mountain. Spring time produces a spectacular variety of wildflowers in this park. 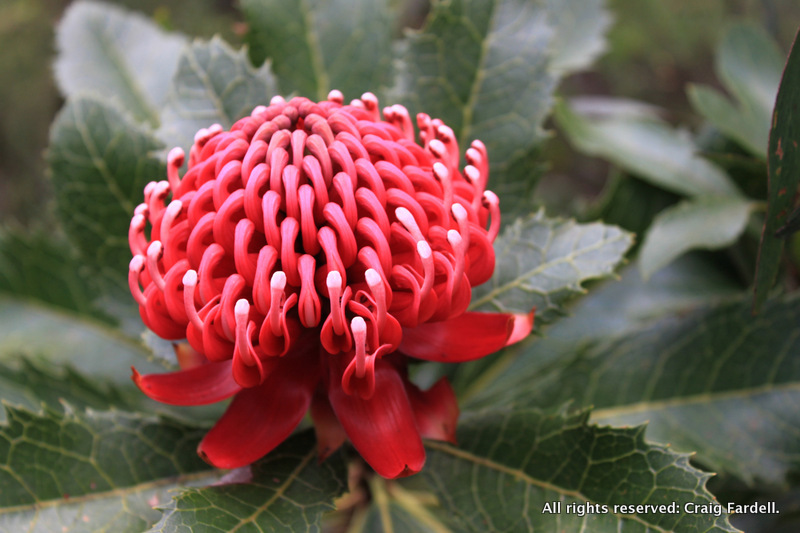 In particular October and November is ideal for seeing brilliant displays of waratah in the bush. 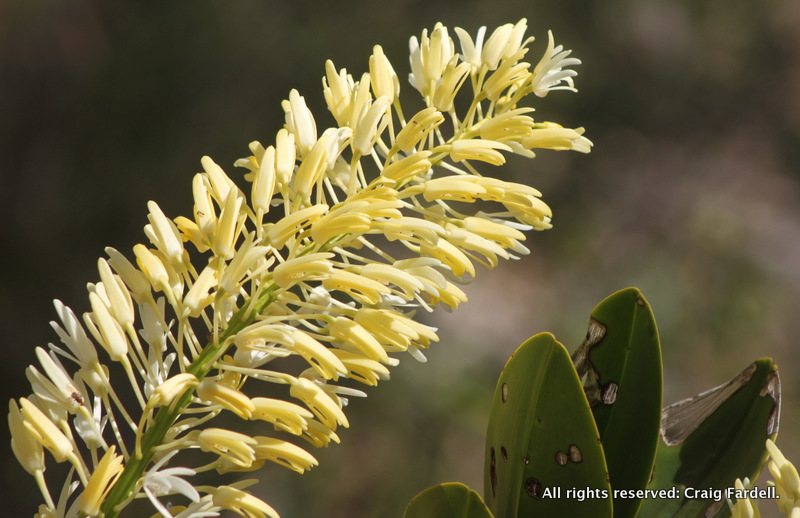 Also from Boundary Falls day use area walk along the Lyrebird Falls track for the chance to see king rock orchids flowering profusely below the lookout.